Warm white sand beaches, crystal indigo seas, romantic Caribbean nights, world- class hotels, restaurants and nightlife, world-renowned fishing, diving and snorkeling, archeological sites dating back thousands of years, a balmy tropical climate and water sports galore. A resort where you could keep busy 24 hours a day just participating in the many activities and tours available, and yet it remains a tranquil retreat where you could relax to your hearts content. In Cancun you can literally choose a pace and lifestyle to suit any frame of mind, from ultra chic to funky laidback beach bum. Cancun is a resort for everybody, from college students on a strict budget to the rich and famous from all over the world. Cancun caters to all who visit and everyone should experience Cancun at least once. Everything just seems to flow together effortlessly in Cancun. 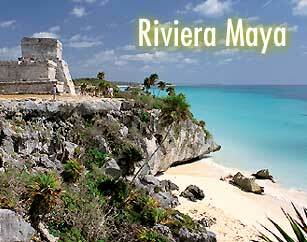 This is one of the reasons that Cancun is Mexico's most popular resort, the other reason being... Location, Location, Location. Just south of Cancun, sitting on the workd’s most beautifly 80 miles of shoreline, you’ll find hotels of spectacular quality, unspoiled beaches, turquoise waters, tropical jungles and Mayan ruins. Playa del Carmen's quiet ambiance is found after a short 45-minute drive south of the Cancun Airport. Thirty miles further down the coast lies Puerto Aventuras, a perfect backdrop for a leisurely vacation. Continue south to Akumal, a nature lover's paradise. Enjoy incredible values under the sun at a vast array of fabulous resorts! With its close proximity to Cancun, Cozumel and the most popular sites of the Yucatan, it's no wonder that the Riviera Maya is a favorite of many vacationers!